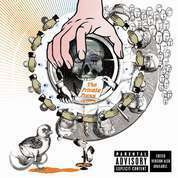 RapReviews.com Feature for May 14, 2002 - DJ Shadow's "The Private Press"
To say that DJ Shadow's forthcoming sophomore release is being highly anticipated is putting it lightly. Way back in 1991 when he was Unsigned Hype in "The Source", I didn't even have to hear what he was about. I knew that this "Shadow" character had to have something. For years we grew up thinking a hip-hop artist had to be about ego. First and foremost you said your name in your songs, or the name of your DJ. Hip-hop at its best is the art of the boast. But here was an artist who chose not to show his face, but rather have someone draw the image of what someone named Shadow might look like. Eleven years later, I'm still waiting to hear the mixes discussed in that Source article. I felt he finally had success with "Shadow's Legitimate Mix", a remix he did for hire on a Zimbabwe Legit EP. I liked it because of his use of a sample made famous by the Beastie Boys, Idris Muhammad's "Loran's Dance". Shadow, as I knew it, disappeared for awhile. Two years later, I keep on seeing DJ Shadow's name pop up in various magazines, along with little ads for Solesides Records. Way back in 1994, it was somewhat difficult for average Americans to find records on Mo' Wax, the UK label he was signed to, but it didn't stop diehard music fans from hunting them down anyway. In 1995, I read an article somewhere talking about the coming of DJ Shadow, and the hype machine had already begun. It was promoting it as an album that would take sampling to an all new level, and as someone who has always preferred sample-based production styles, I eagerly waited to see if the hype was true. Since then, DJ Shadow has gained a slow but steady following, with fans coming into his music differently from one another. The man born Josh Davis has not stopped recording since the release of 1996's ENDTRODUCING, in fact he has released at least one project a year, including 1997's "High Noon" single, 1998's "Pre-Emptive Strike" compilation and UNKLE's "Psyence Fiction" album, 1999's "Brainfreeze" mix project with Cut Chemist, 2000's "Dark Days" single, and a reunion with Cut Chemist, "Product Placement". So why are fans highly anticipating "The Private Press"? Because it's been six years since Shadow has released a proper album. Shadow himself had been showing hints of what's to come in his other projects, and in interviews he often talked about wanting to try new techniques and styles. Regardless if he chose to use a sampler or a computer interface, he wanted to make sure he would still be able to create an identity with his music. He doesn't have to worry. "The Private Press" shows a heavy progression from "In/Flux" and "Entropy", when he was all about turning people on to the untapped funk and soul, along with his love of progressive rock and folk records. Shades of old Shadow show up in the album opener, "Fixed Income", where you have guitar melodies mixed in with a tight drum track, immediately creating a mood and atmosphere. One could say the song is a retrospective of the past, as one can easily hear references to "In/Flux", "What Does Your Soul Look Like (Part 4)", "Building Steam With A Grain Of Salt", "Lonely Soul" and "Dark Days". But then the story of "The Private Press" begins with "Walkie Talkie" where Shadow does something he hasn't done verbally in his music since 1993's "Entropy": he boasts about himself with scratches of "I'm a bad... motherfuckin'... DJ/this is why I walk and talk this way!". It seems our favorite DJ savior is carrying some attitude into the new project, but deservedly so. One has to listen to this with a bit of humor, because it seems Shadow is a very humble person, yet he gets endless praise from every direction. He finally answers the critics and naysayers with a song that seems to play up on this, at the same time telling today's hip-hop children that they still have a lot to learn, if they are willing to be educated. "Giving Up The Ghost" originally circulated when Shadow himself had an acetate of an early mix sent to a London radio station. As soon as it was broadcast, someone recorded it and turned it into an MP3, offering fans a first glimpse of Shadow's new album. The guitar, chimes, and atmosphere created in the first section of the song is different from his previous work, as the groove seems to sound like a mix of 1980's new wave and techno-pop. The album version is at a slower tempo than that of the circulated MP3; also new are a number of extra samples, which help add an eerie element to the song about a ghost. The drum programming in this song is sick, as he goes from just making hip-hop beats into something that might resemble early 808 State records. "The Six Day War" could have easily fit on the "Psyence Fiction" project with its downtempo earthy feel and vocals. In this case, the vocal track is from a sampled source (Colonel Bagshot). Here, Shadow creates a melancholy soundscape with echoes of war drums (both from the jungle and the battlefield). The lyrics talk about going through life on a day to day basis, and realizing that if you don't take up an opportunity that is given to you, it might be too late. Since Shadow has managed to gain popularity across the board, this might become a surprise hit for him. "Right Thing/GDMFSOB" begins with an 80's instruction recording on how to create a song, before the tempo speeds up and turns into one of his funky cut & paste masterpieces. Shadow sets up this song like a car about to start, in many ways his own "Close (To The Edit)". He lays out all the drum beats and breaks, trying to figure out what to use but using them all, and adding little synth and keyboard samples every few bars. Eventually the car is revved up and ready to go, and at this point it seems Shadow just went through 50 or so samples without the listener knowing what hit them. While the previous song showed what can be done with a multitude of samples, "Monosylabik" is an example of how to create a seven minute song out of a 6 second section of a record. Here, Shadow rips up a song and tears it up in a number of ways, from slowing it down, chopping it, slicing it, and spreading it around to repeating sections. What he's doing isn't exactly new, The Beatles brought tape manipulated sounds to the mainstream, and Louis & Bebe Barron processed electronic sounds by slowing them down (processing) to make new music. "Monosylabik" also shows a heavy Kraftwerk and Art Of Noise influence, with the beats entering the machine and coming out warmer than normal. The Quannum crew show up in the uptempo funk groover "Mashin' On The Motorway", with Lateef The Truth Speaker using traffic metaphors to talk about making an impact in this world, while Gift Of Gab, Chief Xcel, Joyo Velarde, and Lyrics Born become a part of the road rage scenery. Once again, Shadow crams so much into this song that it seems too difficult to consume all at once, which makes it even more appealing. "The Private Press" closes with two of his most emotional pices of work to date. "Blood On The Motorway" could be interpreted as a prayer for a world that is very different from our childhoods, with a church-like piano and church bells opening the song and chaotic beats filling the second half of the song. The entire track is created like an early 70's rock masterpiece, complete with strings and the build-up as the song gets faster. Unfortunately, he doesn't offer a sign of hope, but rather ends with the somber line "it's too late/eternity has come". And eternity arrives in the emotional "You Can't Go Home Again". The use of a very crackly record sounds like an old radio broadcast from days gone by, before Shadow lays all of his 80's influences on the table, complete with jumpy guitar and bass hooks. On the surface, it might seem Shadow is trying to create an energetic dance song, and maybe that was one of his intentions. But he seems to be saying, through the samples, that as much as we enjoy living in the past, it is impossible for us to go back. It is best to move on, as the future can always be as exciting as memories of the past. It is this thought that probably moves Shadow to make the music he does. By digging through the lost dreams found in each record he manipulates, DJ Shadow is able to bring those dreams back to life, to become ingredients in his own stories and dreams he shares with listeners. Or maybe it's his way of letting people know that what we know from him is his past, now we must look forward to hearing the future. Throughout the album are interludes taken from old records called Recordios, homemade recordings that were the 1940's/1950's equivalent of voice mail. A family could record a 2 minute message which would be pressed on a cardboard record, and mail it as a gift to someone. Some of these records are like diary entries, and were probably not meant to be heard by anyone else. Only one copy of these records exist. This is "The Private Press", in a way a series of personal stories told by an artist who still has a lot of tales to tell. He may have to one day move out of the way for other storytellers, the students who may one day outshine the teacher. In the meantime, DJ Shadow has many lessons in his notebook to keep the pesky kids in check.